Iced Tea is a Southern Classic and perfect on these hot humid days like we have here in Mississippi in the summer! 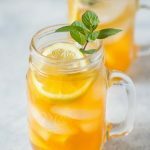 Homemade Iced tea is so simple to make, you really can’t go wrong with it! One of the keys to making it is to use quality teabags, the same sort you would use to make hot tea. As a bit of a tea aficionado I think that the flavor from the teabags made for iced tea only is inferior to regular teabags, so I always use a quality brand like PG Tips or Taylors of Harrogate or something similar. These days you can find PG Tips in most US supermarkets, but if you can’t lay your hands on it just buy a good quality English breakfast tea. I like my tea with a touch of lemon and mint. 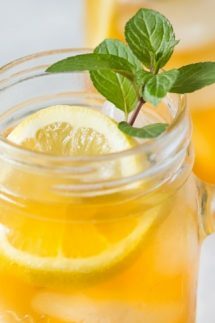 In order to draw out the mint flavor you need to put the fresh mint leaves into the boiling water when you steep the teabags, the mint flavor will really come out with the hot water, then you can add a lemon slice to your glass and sweeten with low carb sweetener, sugar, or honey to taste. Is it Healthy to drink Iced Tea? Tea contains healthy antioxidants and has much less caffeine than a cup of coffee, white and green teas contain more antioxidants than black tea. As long as you don’t over load your tea with sugar, then it’s healthy. 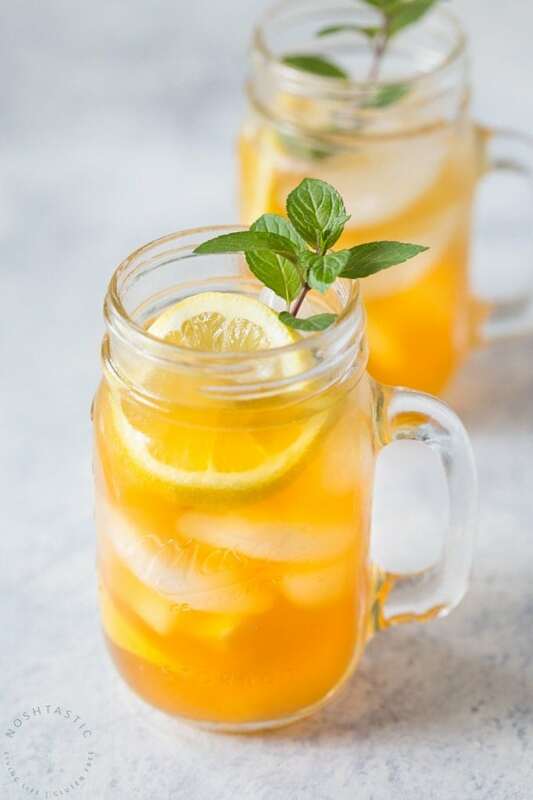 If you want to drink sweet iced tea try cutting back the amount of sugar, use a low carb sweetener, or add a little honey instead. Add the teabags and fresh mint leaves to a heat proof pitcher and pour over the boiling water, stir well and let it sit for 20 minutes. Serve over ice with a lemon slice in each glass.